Horizons: Democrats: Now is NOT the time to abandon the Obama coalition! Democrats: Now is NOT the time to abandon the Obama coalition! Any pundit who attempts to comment on our current political climate while ignoring the role of race and racism is simply blind - most likely by their own white privilege. While I have had some issues with his approach lately, Tim Wise nailed it a few years ago when he talked about the current "perfect storm" for white anxiety. To ignore that is to miss a big part of the picture. The factors Wise outlines are exactly why we are currently living in - as Rev. Barber articulated - a Third Reconstruction. That struggle isn't limited to the battle over voting rights. It is also captured by things like the nativism that has been stirred up over immigration reform and the tension that is building between law enforcement and communities of color (i.e., Ferguson). Today I woke up to a story about how that is playing out in my own community. 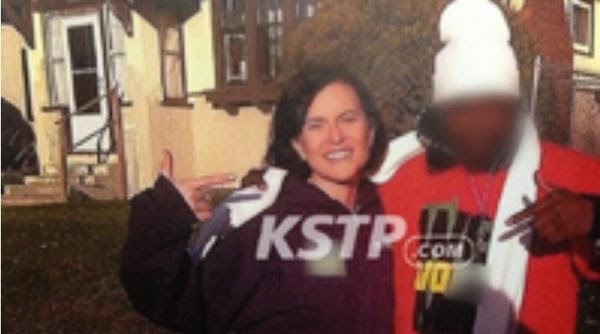 Yesterday, the local ABC affiliate in the Twin Cities ran a story titled: Mpls Mayor Flashes Gang Sign with Convicted Felon; Law Enforcement Outraged. As it turns out - this "convicted felon" is not a gang member, but has a job working as a canvasser for a local GOTV organization while he is on probation. He and the Mayor were celebrating their door-knocking work last weekend by pointing at each other. KSTP (the local ABC affiliate) was quite clear that they based their story on the "outrage" of law enforcement - who just so happen to be fighting the Mayor on the reforms she is proposing to the Minneapolis Police Department to end disparities. So the back story is that law enforcement thought they could discredit the Mayor by tapping into the racist idea that she is convorting with (black) criminal gang members. One officer in the clip of the newscast that I linked to above even goes so far as to ask "Is she going to support gangs or us?" But folks are fighting back. If you want to see how, just check out the twitter hashtag #pointergate - the story is going national. In conclusion, the point I want to make with all of this is that lots of pundits and political strategists are in the process of suggesting that - as a result of the midterm losses - Democrats should abandon Obama's efforts to expand the electorate and instead focus on how they can win support from southern white working class voters. I read that as: "Standing up for civil rights is not going well with white voters, so its time to abandon that one." You can FOR SURE count me out on that idea!!!! I'm SO glad to hear that ya'll are fighting back against the use of racial stereotyping to smear the Mayor and this GOTV canvasser! And I'm with you -- if the Left begins floating the notion that courting white voters means abandoning the party's commitment to defending and expanding civil rights, we need to unambiguously and firmly reject that notion. Using President Obama's framing -- we are flexible, but that is one of those core principles that simply *cannot* be "negotiated." Not only is it morally wrong, it's foolishly dangerous on practical terms as well. If we're going to be a welcoming, "big tent" party, we cannot afford to abandon the priority status we give to civil rights, because we cannot afford to alienate *any* "out group" (well...except for those poor, poor, misunderstood billionaires the Right wants to coddle). good luck with that tactic. After all that approach worked so well for Alison Grimes..wait what? What a massive step backwards that would be. Like black folk and other minorities will just placidly sit by and say not a word. That "thinking" is SOMEthin', though, no? 'Oh, yes....we just get to decide continually about the lives of others and they will just go along because the only benefit that matters is the benefit to "us" '. Ummhmmm...."Billary" pulled that crap tryin' to beat PBO back in '08 so we can go back even further than Ms. Grimes (and she will have her feelings hurt yet again if she and them "PUMAS" start actin' silly). Same outcome. The Party needs to demonstrate COURAGE. What many of us have seen ever since PBO came into office is the amazing lack of presence and voice from any number of Dems in terms of hard, vocal, persistent narrative setting (since that appears to be the way it's done now). And, even if that decision were made, the proverbial "Liberal" point of view has very little of the air waves (we are still strange "intertubes dweebs". the bulk of the people are "informed" through television). The Repubs OWN the airwaves and, lies and garbage though it is, they SAY it, and SAY it, and SAY it.